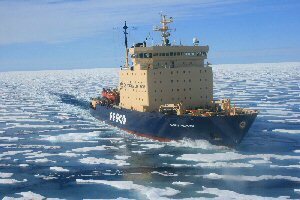 In October 2009, Quark Expeditions announced that the polar adventure company's flagship, Kapitan Khlebnikov, will retire in March 2012. Four months later, Quark announced that the 13-itinerary End of an Era program is an unqualified success. One of the voyages to remote locales in Antarctica has sold out, and others in the Arctic and Antarctica are well on their way. Despite the fact that the ship's retirement is two years away, travelers who hesitate to reserve a cabin may find they have missed the boat – or in this case – the icebreaker. There are cabins left on Quark's first End of an Era sailing, Northwest Passage: West to East (July 18 to August 5, 2010). On that voyage, special guest Andrew Lambert, author of The Gates of Hell: Sir John Franklin's Tragic Quest for the Northwest Passage, will return to Khlebnikov to deliver presentations about Franklin, and why a pursuit of scientific discovery had disastrous results. Also, the Laughton Professor of Naval History, will be present when the documentary, Franklin's Lost Expedition, in which he and Khlebnikov appear, is shown. "We are very pleased that Professor Lambert accepted our invitation. His reinterpretation of the Franklin story has changed completely the way the world understands the event," said Quark's president, Patrick Shaw. Shaw continued, "The success of our End of an Era program is bittersweet. We are disappointed that the icebreaker will no longer be a part of our fleet, yet, we are delighted at the response of polar travelers, who have embraced the program so enthusiastically." A free information kit about the Northwest Passage voyage can be downloaded from the Quark Expeditions website. Per person prices start at $16,490. The 19-day expedition embarks in Anadyr, Russia and disembarks in Resolute, Canada. Quark Expeditions was the first polar adventure company to transit the Northeast Passage with commercial passengers; the first to take travelers to the "far side" of Antarctica and the first to circumnavigate the Antarctic continent with guests, twice. In 2006 and 2007, Quark was named a recipient of National Geographic Traveler's "50 Tours of a Lifetime" for "Emperor Penguin Safari" and the "Far Side" respectively. In 2006, Outside magazine named Quark's "Emperor Penguin Safari" as one of the New Trips of a Lifetime.